Yohanna Escamilla began her dance training at the age of eleven in Bogota, Colombia under the instruction of professional dancer Janeth Cifuentes. In 2002, she was accepted into the Substitute Company at the Ballet Folklorico Tierra Colombiana where she studied ballet, jazz and Latin-American Folklore. In 2003 she received her initial flamenco dance training performing with the group "Aires de España" directed by Julio Cesar Roman and later on she studied with Junny Zarate "La Yunna". 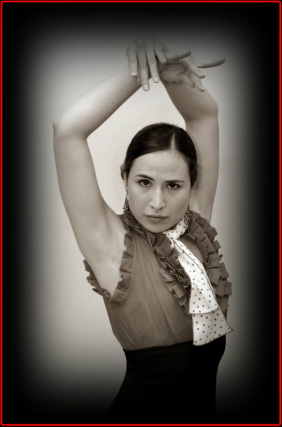 After moving to the United States, her interest for flamenco dance led her to continue her training under the instruction of Melinda Marquez at the Melinda Marquez Flamenco Dance Center, and taking Flamenco dance workshops in New York with Flamenco dancers Rosario Toledo, Fanny Ara, La China, Carmen Ledesma, and private instruction with Xianix Barrera and Marilia Quevedo; a Flamenco choreography/Stage workshop by Soledad Barrio Company director Martin Santangelo, and cante/structure with the Flamenco singer Alfonso Cid. During the last seven years she has performed with the Melinda Marquez FDC ensemble, and as a soloist in tablaos and private events in Connecticut and New York where she has been accompanied by Flamenco singer and mentor Alfonso Cid, singers Jose Moreno, Aurora Reyes, Barbara Martinez, and Mario Rincon; guitarists Arturo Martinez ‘Espiritu Gitano’, Jared Newman, Val Ramos, Jose Ramos, Basilio Georges, Raphael Brunn, Nolan Ericsson, and currently is working with singer/guitarist Cristian Puig. Some of her latest choreography works were made for the event “Guitar under the Stars 2013”, where she shared the stage with artists such as Daniel Salazar Jr., singer Jose Paulo, The Hartford Symphony Orchestra among others; on February 1st, 2014 Ms. Escamilla directed/produced/performed the Flamenco show “Flamencas de Connecticut" –A new generation of local Flamenco artists- in Norwalk, CT; on February 14th for the event "Romance de la Guitarra" she choreographed 5 different pieces, some of them were: The Fire Dance, The Mill's Dance, and Leyenda/Asturias. On May 17th, 2014, Ms. Escamilla performed/choreographed for the Opera "Carmen" sharing the stage with the Norwalk Symphony Orchestra, worldwide known Opera singers Audrey Babcock, Brian Cheney among others, The Mendelssohn Choir of Connecticut, Carole Ann Maxwell, and The Fairfield County children's choir. On October 9th 2015, Ms. Escamilla was among the 10 finalists to compete in the 2nd New York City Flamenco Certamen that was held at the Bruno Walters Auditorium in the Lincoln Center. Her last stage performance was held at The Palace Theater on March 12th 2016, where she danced for the pre-concert dinner for the Carmen Concert by the Stamford Symphony Orchestra. On May 20th, 2017, Yohanna was honored by the city of Norwalk for her professional accomplishments and as an exceptional flamenco dancer in a proclamation made by Mayor Harry W. Rilling. She is currently teaching Flamenco and Latin dance to children and adults and is the director of the Youth Flamenco Dance Company at Studio Arte located in Norwalk, CT. She is also a teaching Artist for Connecticut Ballet's ‘World of Dance’ program and instructor for CT Ballet Center's summer intensive. Yohanna is looking to bring more Flamenco to Connecticut, and open a path for the currently young students of the area. She also encourages the community to support this art form and our young artists by attending to the different local events.